If you have pets, moving house can take on a whole different dimension. Not only do you have to think about the practicalities of moving them on the day, but you also need to think carefully about introducing them to their new home and keeping them safe there. Different pets need different approaches so let’s take a look at some of our top tips for making your house move as stress-free as possible for much-loved family pets. 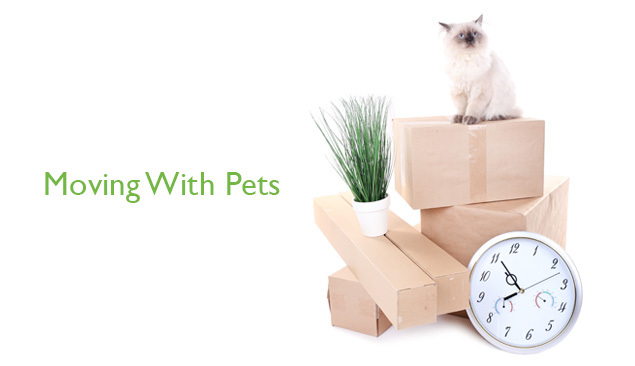 Firstly, think about the practicalities associated with moving a pet. Do you have suitable pet carriers? Different pets require different crates so make sure that you have suitable carriers for each of your animals well in advance of the move. Also, remember to get any microchip details updated with your new address and contact details and, if necessary, get new collar id tags made with your new address details. Think carefully about the different requirements of your pets and plan their part of the move accordingly. For example, transporting an aquarium is a complicated, multi-stage process and one that you may have to start a day or two before the move. Consider seeking specialist advice from your vet or another animal specialist if you have particularly unusual pets that require special care or have specific issues surrounding the move. Pets should be transported with you in your car, not in the removal van. Make sure that you keep enough space free in your car for your pets in their travel crates and any familiar items you are taking with you. Try and have a quiet space that pets can be kept in while your old house is being packed up and ensure that a similar space can be arranged in the new property. Ideally this should be a self-contained room where you can keep your pet or pets in safety while the packing/unpacking is taking place. Make sure you have food and water easily available for pets at all times during the day, try to have some familiar toys available and, if appropriate, their bed or a favourite rug accessible for them to lie in/on. If the thought of moving house and moving your pets at the same time is just too overwhelming, consider using a pet sitter on the day of the move. This could be a professional or even a family friend, but it will mean that you can get on with the bulk of the move without having to worry about supervising your pets. And when they finally arrive at their new home, your pets may feel more secure seeing familiar furniture and belongings already in place.